As this is being written it is early January and I have just returned from a holiday trip to Bentsen- Rio Grande Valley State Park in south Texas. It was primarily a birding trip, as the overcast, 60° weather (that Texans call winter) was not favor able for butterflies. However, in walking the trails, I happily recalled some truly spectacular butterflying days of other years, and I hope that this guide will help my fellow butterfly enthusi asts to have equally satisfying experiences. First, however, let’s talk about the weather. Many of these experiences occurred in the 1960’s and 1970’s, decades of consistent nor mal rainfall increased by several hurricanes and tropical storms. More recent years have seen frequent drought conditions. A Labor Day 1992 visit, for example, found much of the vegetation leafless and only a dozen or so species of butterflies on the wing. Additionally, a number of vegetational remnants formerly existing in the park vicinity have now been cleared. 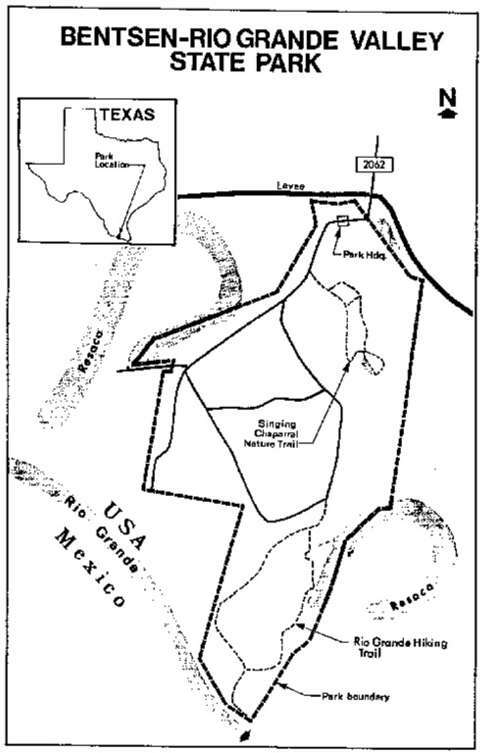 Northern Mexico has also undergone extensive agricultural development, reducing the corridors by which many tropical species reached the United States. Keep these caveats in mind as we take an imaginary tour of the park. are some of these. Important nectar sources are thistle, aster, lantana, Fogfruit (Lippia), Purple Joe-pye Weed (Eupatorium odoratum - a major fall attractant) and anything else that blooms! There is a single paved road that loops through the park, with one crossroad (see map). There are tent and trailer camping areas, a shaded picnic area and two nature trails. All roadsides, trails, park edges, etc., can provide interesting butterflying on any given trip. There are in excess of 200 species of butterflies recorded for the lower Rio Grande Valley of Texas. The list I have appended is somewhat dated and contains 164 species actually recorded within park boundaries. Many of these are tropical species at the extreme northern limits of their ranges and are known from only one or two records, or periodic but temporary introductions. There is, therefore, great potential for both happy and unhappy surprise! Generally, there are different groups of species occurring in spring, summer and fall, although many species do fly year-round. Winter months produce the fewest number of species, with maximum species counts occurring in October-November. The small size of the park makes it possible to visit the same locations at different times of the day. There are some species, especially skippers, that fly along woods edges in early morning and late afternoon. Other species seek shaded areas to rest during the heat of day, and still others fly chiefly at dusk. I have also seen many butterflies on the wing in light summer rain! A given habitat may thus be productive or unproductive according to the time of day. The key to success is to visit as many habitats as possible at as many times of the day as possible. We’ll start our park tour at the Singing Chaparral nature trail, which begins from the park road shortly past the headquarters. This trail is about a mile in length and branches into two forks a few yards from the trailhead. The right fork runs mostly through open country. If there has been sufficient rainfall, there can be thistles here in the spring and asters in the fall. Swarms of butterflies can occur in such cases. Tropical swallowtails can sometimes be found on the thistles and some rather exotic skippers on the asters. The only recorded Morning Glory Pellicia for the U.S. was found here on an aster blossom. Generally, along this part of the trail one can find sun-loving species such as sulphurs, blues, nymphalids, swallowtails, and tawny skippers such as the Fiery Skipper and Whirlabout. It is also a good location for White-striped and Brown Longtails. The Plain Longtail also has been recorded here (once). If rainfall has been scarce, this can be an unproductive area. The other branch of the Singing Chaparral Trail is more wooded and borders areas that are wetter. This is a good trail for observing Lyside Sulphur and White-patched, Brown-banded and Sickle-winged Skippers during the day. In late afternoon several small skippers in the Clouded Skipper group can be found perched along here. Look in the treetops for swallowtails. The common Giant Swallowtail flies at normal height and has an orange appearance, but related species, such as Broad-banded Swallowtail, often fly at treetop level along this trail and look yellow in appearance. The two forks of the trail reunite at a small gully that holds water in wet years. This area is often cool and lush, offering good butterflying during mid-day. The next area we'll investigate is the picnic area at the intersection of the park road loop. This is an area of open shade with trails leading back into more dense thickets. It can be an excellent spot for butterflies roosting under leaves during the heat of the day and at late evening. This is a good spot for Dorantes Longtail, which patrols the trails at dusk. Sunlit branches in late afternoon can harbor Goodson’s Greenstreak, as its larval foodplant, Bloodberry, is common in the understory. The only known Blue-studded Skippers from the U.S. were found flying over a patch of sunlit ground near the picnic tables. I highly recommend this locale as a great place for a lunch break. My favorite habitat in Bentsen-Rio Grande Valley State Park is the Rio Grande Trail. This trail is a two mile walk, roundtrip, and I advise carrying water. Like the Singing Chaparral Trail, it branches into two forks. The right fork is more open and sunlit, with much more herbaceous vegetation along it. This branch can be poor in dry weather, but excellent when there are flowers blooming, especially in the fall. Patches of Fogfruit, a ground cover with tiny white flowers, are common along the trail and attract many species, especially crescents, small skippers and blues. There are a number of species which perch or patrol along this trail including the Two-barred Flasher, Glazed Pellicia, Banded and White Peacock. Look for Balloonvine growing in spots along here (and near the river on the other fork); there are usually Silver-banded Hairstreaks near this, the larval foodplant. The left fork of the trail is wooded with understory vegetation often sparse. The best butterflying, even in dry years, occurs along this trail in the fall. The portion bordering the resaca (see map) has an abundant growth of Purple Joe-pye Weed, which blooms in late October. Plants are scattered through the woods at this point and especially in the heavy growth along the resaca. Careful work in this location can turn up in excess of 50 species in a day, so time spent working along the resaca is justified. Other portions of the left fork are good for bluewings, crackers and emperors perched on tree trunks. Clearings along the trail, past the resaca, are good for hairstreaks, blues and metalmarks, especially if Fogfruit is in bloom. At the end of the trail is the Rio Grande. It is rather grown up but I have seen some nice species under the willows here. Most roadside areas in the park can be worth walking, especially if there are trees and wildflowers in bloom. I have seen most of the nymphalid species at some point along the roadsides and edges of the park. I have not seen many butterflies in the camping area but some of the trailer camping loop has been productive. One technique I have adopted is to simply pick a spot and sit in a folding chair for a couple of hours with a binocular. I have been especially lucky in observing egg-laying females in this manner and hence have made some larval foodplant discoveries. A few additional comments may be in order. Note that over a third of the species listed are skippers. This is one of the difficult groups to sight identify. Indeed, many of the scarcer species on the list were identified by experts who had to dissect the genitalia to confirm the identification. On the other hand, this group can offer great rewards and is essential for those interested in maximizing species lists. All skippers occurring in the Texas Rio Grande Valley are, I believe, illustrated in Scott, “The Butterflies of North America” now available in a soft cover edition. Opler’s “The Butterflies of Eastern North America” also lists and illustrates most of these. I use both of these books frequently. While at the park, ask the headquarters personnel if they still have copies of the butterfly checklist compiled by Bill McGuire and myself a few years back. In terms of clothing, etc., temperatures from May to September can exceed 95° with high humidity. Fall daytime temperatures are in the 70°-80° range. Winter can be anything from near freezing to very hot. Mosquitoes and chiggers are common, ticks less so, and poisonous snakes are rare. There now are “killer bees” resident in south Texas! And finally, if you are from out-of-state and planning a trip to the park, call ahead and inquire as to rainfall and the condition of the park flora. I hope that this brief guide will encourage new butterflying visitors to Bentsen-Rio Grande Valley State Park. I would appreciate hearing from anyone who has visited or is planning to visit. I will be glad to assist in any way possible. S - stray, not seen most years. Numbers refer to months. For example, the seventh species, Ruby-spotted Swallowtail, is rare and most often seen in June-July and September-November. Bentsen-Rio Grande Valley State Park is located several miles southwest of Mission, in Hidalgo County, Texas. It is at the end of FM 2062 and can be reached from several marked exits of Loop 373 and/or U.S. 83. Address: P.O. Box 988, Mission, TX 78572 Tel.(956)585-1107. The author granted permission to post this article originally published in American Butterflies. English names changed to comply with the second edition of the NABA checklist. Rickard, M.A.1993. Definitive Destination: Bentsen-Rio Grande Valley State Park, Mission, TX. American Butterflies 1(2):4-9.